MINNEAPOLIS (February 18, 2014) – Today Recycle Across America (RAA) launched a national celebrity-driven PSA to introduce society-wide standardized labels for recycling bins — a simple solution that can increase recycling levels by more than 50% and significantly reduce the amount of trash currently being thrown in recycling bins. The “let’s recycle right” campaign focuses on the impact of the standardized labels and the importance of recycling right. The first three celebrity ads releasing this month include: Kristen Bell, Angie Harmon, and Gabby Reece, which are appearing on billboards and in consumer and business media across the country. Every month three new celebrities will be featured in the ongoing campaign; celebrities include award winning actors, tv personalities, top models, professional athletes, platinum musicians, comedians and political figures. 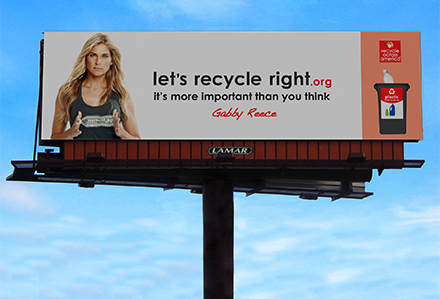 Recycle Across America campaign running on billboard space donated by Lamar Advertising Company. The ads have launched throughout the U.S. on billboards donated by Lamar Advertising and in various national publications, including magazines published by Niche Media. RAA’s standardized labeling system for recycling bins is already being adopted by Fortune 500 companies and is showing to significantly improve recycling levels and the quality of materials captured. Although recycling is the #1 action society can do to help the environment and the economy, U.S. recycling levels are approximately 35% and have barely improved in over 15 years, according to the U.S. Environmental Protection Agency (EPA). This isn’t for lack of interest from the public, but rather it stems from millions of inconsistent labels on recycling bins and general confusion about recycling. The public’s confusion at the bin results in mistakes, apathy, skepticism and ultimately tons of trash being thrown in recycling bins every day. The enormous amounts of trash in the recycling stream, also known as contamination, often cripples the economics and viability of recycling and makes the quality of the materials undesirable or too costly for manufacturers to choose. Therefore, many companies continue to use finite natural resources in the manufacturing of their products and packaging. “Recycle Across America’s society-wide standardized recycling labels have already had a profound impact and as they continue to be adopted by businesses, schools and organizations throughout the U.S., there will be significant improvements to air, land, water usage, conservation of limited natural resources, job growth and the overall economy,” Hedlund said. According to the Tellus Institute and EPA, if recycling levels reach 75% in the U.S. it will generate 1.5 million new jobs (net) and it will be the CO2 equivalent of removing 50 million cars from U.S. roads each year. In 2011, RAA introduced the society-wide standardized labels for recycling bins and to date the solution has been adopted by some of the world’s most notable corporations and institutions. Today approximately half a million of RAA’s standardized labels are now in use throughout the U.S., Canada and Europe. For more information, please visit www.letsrecycleright.org. Recycle Across America (RAA) is a 501(c)(3) non-profit organization, which has developed the first ever society-wide standardized labeling system for recycling bins to help eliminate the public confusion surrounding recycling. RAA and the standardized labels have been identified as a world-changing solution by Ashoka Global Innovators for the Public and have been referred to as "... one of the top environmental fixes taking root today" by the New York Times. This initiative represents what can be accomplished when simple solutions are implemented making it easier for society to act on their good intentions. For more information, visit www.recycleacrossamerica.org. Lamar Advertising Company is the nation’s leading out-of-home advertising firm. Lamar offers solutions for clients in the form of bulletins, posters, digital billboards, buses, benches, transit shelters and highway logo signs. Founded in 1902, Baton Rouge-based Lamar has a broad corporate reach with over 200 locations across the United States, Canada and Puerto Rico specializing in outdoor and transit advertising. In addition, Lamar has 22 locations devoted to the highway logo sign business. This network provides clients with local market insight, as well as the services provided by a firm on a national scale. We have a lot to offer, but it all serves one purpose: helping our clients stand out. Please feel free to explore our website www.lamar.com for additional information. Niche Media is the country’s premier regional lifestyle publishing company connecting the affluent reader with the most insightful and engaging content, inspired by our influential world-class communities. Niche Media is a subsidiary of Greenspun Media Group (GMG), which traces its roots back to the launch of the Las Vegas Sun in 1950. Niche Media’s city-specific publications include: Art Basel Miami Beach, Aspen Peak, Austin Way, Boston Common, Capitol File, Gotham, Hamptons, Los Angeles Confidential, Michigan Avenue, Ocean Drive, Philadelphia Style, Vegas and Wynn. GMG publications include: Las Vegas Magazine, Las Vegas Weekly, VEGAS INC and Vegas2Go. GMG and Niche Media titles exceed 30,000 pages with a combined annual distribution of 19 million copies nationally. For more information, visit www.nichemedia.net. 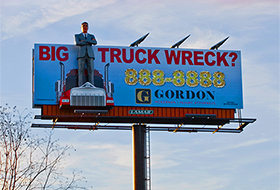 Local personal injury attorney Gordon McKernan is making a major statement in Baton Rouge, thanks to new 3D billboard embellishments from Lamar Advertising Company. Something new has arrived in Pittsburgh, just in time to warm people up. 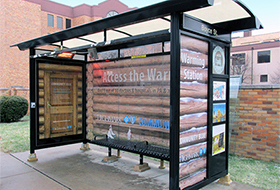 Highmark and Lamar Advertising's Pittsburgh office transformed four bus shelters in Pittsburgh into warm log cabins - complete with warming stations - for this innovative winter campaign.